Notice the different colored flags along Mexican beaches? Ever wonder what they mean? Is it safe? Should I proceed with caution? Should I not dare get in the water? Sandos Hotels and Resorts offers a glimpse into what they mean and what you need to know. Most of us associate green with go and the same holds true here. 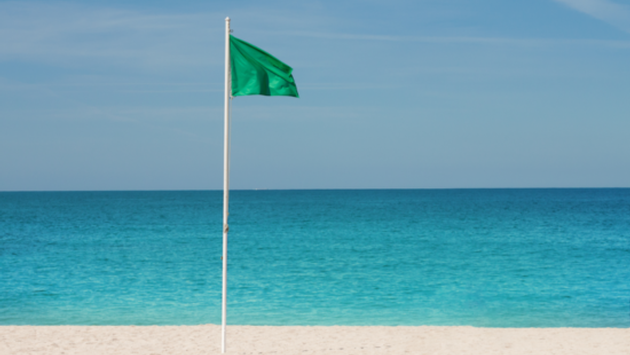 Green flags mean sea conditions are safe to swim. This flag is the favorite for families because they can feel safe when they see their children swimming along the shore and making sandcastles. If you see a yellow flag, you should proceed with caution. Make sure you swim carefully. Adults and children can still swim, but make sure you keep an eye on your loved ones. When we see red, we generally think to stop. That isn’t completely the case here. Red flags signify dangerous sea conditions and require extreme caution. You’re technically still allowed to swim, but it’s not recommended. Use severe caution if you do. Black flags? Well, those are a no go. Black means the conditions of the sea are extremely dangerous—do not swim or enter the water. If you’d like to avoid the possibility of an incident occurring, please, do not swim. If you’re ever unsure of the condition of a beach, go to the lifeguard stand and ask. The sea and the weather are unpredictable. Take basic measures—such as not entering the water if you have just ingested food or drinks, especially alcohol. There are plenty more activities to enjoy on the beach that don’t involve swimming—like Zumba classes, meditation, sand castles and even beach volleyball. If you want to visit the most beautiful beaches in the world, choose your destination and book now at any Sandos resort in Mexico!